We have experienced many natural disasters in the past several years, which is a contributing factor to our raising cost of home insurance. 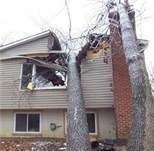 We at Curtis Insurance Agency have helped our clients with claims on their homes where trees have fallen through the roof, lightening struck the home, wind damage to shingles and siding, sump pumps have failed during heavy rains. These are only a few of the types of claims that Michigan homeowners have experienced and why we are experiencing the increased cost in our policies. Protecting your home and having the funds to re-build when diasters and accidents occur is very important to protecting your investment and providing peace of mind to you and your family. How can you manage your insurance costs?